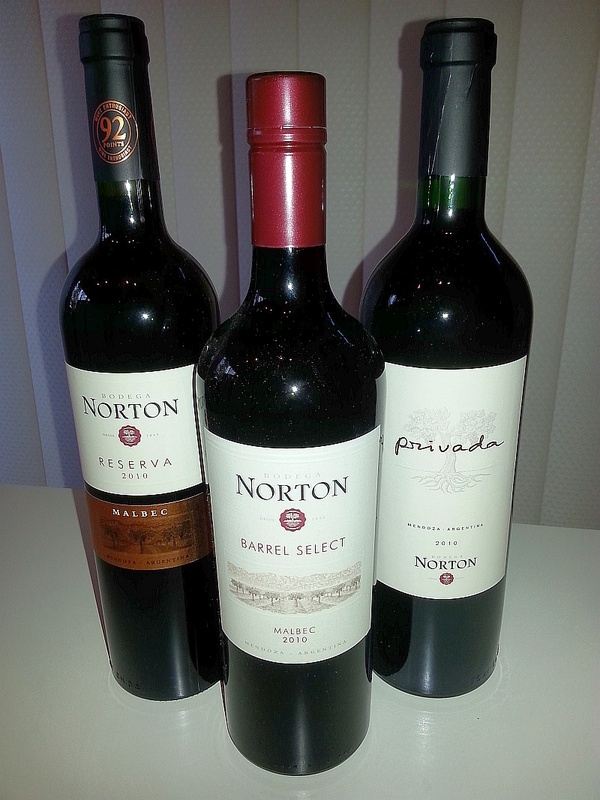 Bodega Norton started in 1895 when Edmund James Norton arrived in Mendoza, Argentina. He founded Bodega Norton, south of the Mendoza River, planting vines he imported from France. It wasn’t until 1989, almost 100 years, before Gernot Langes-Swarovski from Austria bought Bodega Norton. Through his efforts, in 2006, Wine Spectator nominated Bodega Norton as one of the top 20 wineies in the world. 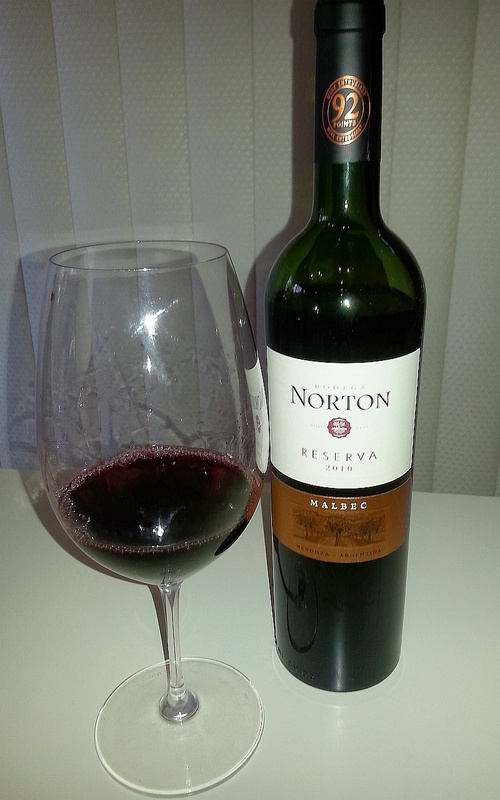 In 2010 Wine Spectator names Norton’s 2007 Reserve Malbec as one of the top 100 best wines in the world. And then in 2012, Bodega Norton’s Chief Winemaker, Jorge Riccitelli was awarded as “Winemaker of the year 2012” by Wine Enthusiast. Quite an array of accolades for this winery. Argentina has been having a great red wine run around the world with their signature red grape, Malbec. This is a Bordeaux grape that needs enough heat and growing season to truly ripen and be more than a blending grape. Argentina’s high altitude Mendoza region has everything that Malbec needs to be very expressive and to make a great single varietal wine. It has a very dark purple colour in the glass. I can usually spot a Malbec just from colour. The aroma and flavour profile I have found changes quite a bit from the start to the finish of the bottle. Dark fruit (red and black), cherries, chocolate, plum, pencil leads, and more. This is typically a big wine with medium to firm tannins that can be paired with a hardy meal or BBQ. As usual, I tasted each of the wines below two times, usually separated by 24 hrs. This time I tried a bit of an experiment with the wine. I recently received a Vinturi wine aerator for red wine as a birthday gift, so I tried the wines once straight from the bottle, then I waited approximately 6 hrs then poured the wines through the Vinturi. Did I notice a difference? Read on. Bodega Norton Barrel Select Malbec 2010, Argentina (BC $14.99) -Deep ruby in colour with a medium intensity nose of blueberies, ripe raspberries, black cherry, black current, other black fruits and hints of vanilla, oak and nutmeg. It also had a bit of meatines to it. Dry on the palate, round but not quite soft due to the acidity in the wine. I picked up more raspberries, black cherry, black currant, vanilla and some flowers (rose) and liquorice. There was also some spiciness to this wine. There was a blackcurrent leaf on the finish for my initial tasting, but it fell off after the second tasting. The tannins were there on the finish but quite subdued. On my second tasting, I noticed some sweet spices on the palate, and that the blackcurrant leaf on the finish was more subdued. I think a bit more of a tannic backbone would help give this wine a bit more structure. It comes in a screw cap and I think is ready to drink right now. It is a straight forward wine to enjoy with dinner, possibly roast beef. Bodega Norton Malbec Reserva 2010, Argentina (BC $19.99) – A step up on the quality ladder from Norton, this wine comes from 30+ year old vines. The wine was deep, almost opaque ruby in colour. The nose was a bit closed, but I picked up purple fruit, raspberries and vanilla. Thie wine is dry with medium plus body and soft mouth feel. The tannins are quite soft. On the palate I first tasted blueberries, along with red cherries, raspberries, vanilla/oak and a hint of violets. This wine mid palate also had black pepper spice. Toward the finish I picked up some milk chocolate. The acidity in this wine, keeps it interesting and I thought would help this wine pair with something having a bit of fattiness such as pork chops, grilled sausages, or possibly roast duck. I was hoping the Vinturi would help open the nose on this wine, but alas not. It did help some cocoa flavour come out. This wine is a bit bigger and had a greater range of flavours than the Barrel Select. I may recommend saving this bottle for 6 months before tasting to see if the nose opens up more. Bodega Norton Privada 2010, Argentina (BC $24.75) – This final wine is a blend of 40% Malbec, 30% Merlot, and 30% Cabernet Sauvignon. It really was quite opaque ruby in the glass and really coated it when swirled. This wine had a medium intensity nose, a little closed, but not as much as the Reserva. I picked up blueberries, black and purple fruit, vanilla, dark chcolate and some meatiness on the nose. It really had a nice silky mouth feel and very enjoyable range of flavours including red and black fruit, blueberries, ripe raspberries, red cherries, plums, black currants and vanilla. It also had some nice flowery perfume, and a mineral streak (which was more evident at the start of the sip). It finished with some spiciness and a tannic kick. It has a medium long length. On my second tasting I picked up some liquorice on the palate and the nose, while the hint of meatiness on the nose had gone away. You can tell tell that this is a high quality wine visually and on the palate. I’d categorize it as very masculine. What to serve with this wine? Maybe a hearty stew, some cheddar or oka cheese, and a dark chocolate truffle for dessert. You can drink this wine now, but I think it may evolve more with aging, so buy a few bottles and try it over a few years. What are my thoughts on the Vinturi for red wine? I was hoping that it would help bring out more aromas for the 2 wines that had subdued aromas, but it did not seem to help too much there. What I did find is that I picked up more subtle flavours and maybe made the wines a bit softer on the palate.